Stand in the midst of Alaska’s state capital and raise your eyes to the sky to watch bald eagles, great blue herons and ravens. Turn to the steep cliffs and avalanche paths behind town and scan for mountain goats and black bears. If you are lucky, you may see humpback or killer whales swim past town. Now, unpack your bags and settle in for a few days. Juneau has a wealth and diversity of wildlife viewing experiences for you, whether you like to go on your own or with a guide. We’ve selected a dozen of our favorite destinations to share with you. These aren’t the only places to see wildlife, but by the time you’ve visited all of them, you’ll have discovered new places on your own. For information on tours and lodging, consult the Juneau Convention and Visitors Bureau. Visit www.traveljuneau.com or call 888-581-2201. 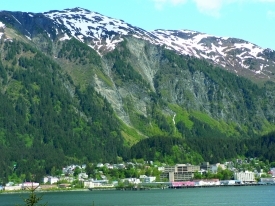 In Juneau, stop by the Centennial Hall visitor center or call 586-2201. Ready to get started? Juneau’s wildlife is waiting – grab your camera, a good pair of shoes and your sense of adventure and head on out!